Thanks to “atticus 70,” here are two wonderful hot sides from the glory days of searing Chicago jazz featuring two sadly short-lived and legendary players, pianist Frank Melrose and clarinetist Frank Teschmacher. The other musicians on the session had longer lives: trumpeter (or cornetist?) Wingy Manone, tenor saxophonist Bud Freeman, drummer George Wettling, accordionist “Charles Melrose.”* Recorded January 24, 1930. The musicians took their name from the club (the “joint,” I think) they were playing in, which was called MY CELLAR. *Aunt Ida told Hal Smith that there was no “Charles Melrose”; Hal thinks the accordionist is Bennie Moten’s brother Bus, sitting in. Any comments on this mystery? REMEMBER: ALL MONEY GOES TO THE MUSICIANS! SO PLEASE CLICK ON THE LINK BELOW! 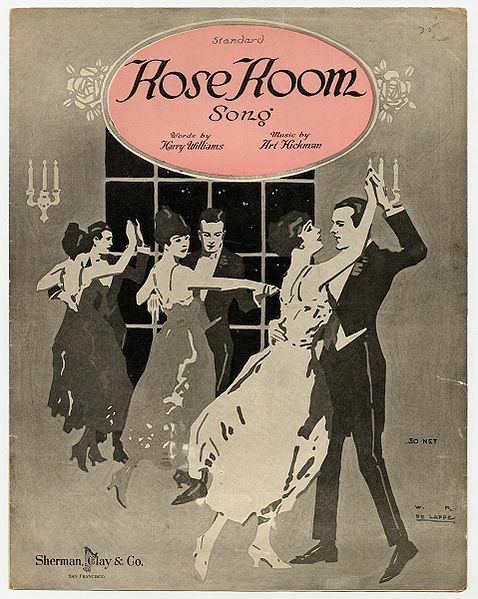 ROSE ROOM, by Art Hickman and Harry Williams, has a special place in the hearts of jazz fans. It’s a lovely pastoral song from either 1917 or 1918, but several things raise it above the level of the ordinary pre-Twenties pop hit. One is that it is famous as the song Benny Goodman called when that interloper Charlie Christian was sneaked up on the bandstand by the meddlesome but inspired John Hammond. Legend has it that Goodman thought — not a nice thought — that Charlie wouldn’t know the song or would find the chord changes difficult and either be embarrassed or sneak off the stand in disgrace. Of course, Charlie had no trouble and he played rings around everyone on the stand. The rest is too-brief history. Two is that it is the harmonic basis for Ellington’s IN A MELLOTONE. Three is that it is one of those songs that reveals itself in different, beautiful ways whenever the tempo is changed. I’ve heard it played as a romp, a saunter (the 1943 Commodore version with Max Kaminsky, Benny Morton, Pee Wee Russell, Joe Bushkin, Eddie Condon, Bob Casey, and Sidney Catlett), and as a yearning love ballad (J. Walter Hawkes, in this century, in live performance). And four is that there is a Louis Armstrong and his All-Stars concert recorded in Vancouver in 1951. For whatever reason, Louis was (atypically) not onstage when the concert was supposed to begin, so Barney Bigard, Jack Teagarden, Earl Hines, Arvell Shaw, and Cozy Cole just jammed ROSE ROOM for a start — an easy hot performance. Were I Ricky Riccardi of THE WONDERFUL WORLD OF LOUIS ARMSTRONG, http://dippermouth.blogspot.com/, I could share it with you right now, but alas . . . you’ll have to imagine it. But all that is prose. How about some music? Last Sunday, the mighty EarRegulars, the reigning kings of small-band swing who appear at The Ear Inn (326 Spring Street, 8-11 PM on Sundays — except this next week, Feb. 6, because of some large-scale sporting event whose name eludes me) took on ROSE ROOM late in the first set. The Ear Inn is dark, but it was sunny Roseland for ten minutes! Who knew that one version of Paradise could be found in Williamsburg, Brooklyn? It’s the Radegast Hall and Biergarten, at 113 Third Street — at the corner of Berry Street — take the L to Bedford Street. In December 2010, I’d gone into new territory to hear the Grand Street Stompers, a delightfully compact jazz ensemble led by Gordon Au, and I had a fine time. The people I’d met had been lovely, the music surprising and reassuring in equal measure, the beer — a lemon-colored, fizzy Gaffel Kolsch — delicious. But it was even better last Thursday, Jan. 27, 2011. I had learned that the GSS would be playing that night. But the days before had been particularly snowy. It wasn’t the Blizzard of 2011 by any means, but it was messy and slushy. Stubbornly, I had decided that I had to be there. Snow boots, knapsack with video equipment, gloves, cash, a street map . . . I patted my pockets to assure myself I had everything a bold jazz explorer needs! I arrived at Radegast more than an hour early, and went into the long rectangular room next to the bar to eat something. After being gently directed by a pleasant waitress to the grill in the back of the room, I stood in rapt contemplation (like Joe Rushton) of the sausages and burgers-in-training sizzling on the grill. “Sizzling” is a dreadful cliche of menu-speak, I know, but in this case it was true. I had a gracious mind-expanding discussion with the grill-Sage about choices, and I ended up with an awe-inspiring meal for less than ten dollars: smoked kielbasa, a mound of warm sauerkraut, some grill-toasted peasant bread, large self-serve helpings of Radegast’s own mustard. I was already in culinary Paradise with this wonderful unassuming hearty unfussy food. I ate it slowly and savored every last molecule. The temptation to return to the grill and say, “Do that again . . . with this sausage,” was strong but but I resisted. I found out later from the friendly manager, Chris, that the owner tailors the music on the sound system to the band playing there that night. So while I contemplated my meal with true reverence, I was even more uplifted by the music. For me, to walk into a place and hear music I love on the sound system is a great, rare gift. For it to be Sidney Bechet and Jonah Jones (Blue Note, circa 1954) was wonderful. For it to be Bobby Hackett and the Andrews Sisters performing BEI MIR BIS DU SCHOEN (1937), even better. For the iPod shuffle to come up with I HOPE GABRIEL LIKES MY MUSIC by Mr. Strong . . . ! Bliss. Then, I went to the bar and ordered my Gaffel Kolsch (I am a one-drink person while videorecording) and it was just as good as I’d remembered. Then the musicians — people I admire and like — began to come in. I had lovely conversations with Gordon (trumpet, arranger, composer); Tamar Korn (vocals and astral travel); Dennis Lichtman (clarinet and wit); Emily Asher (trombonist in charge of blossoming); Nick Russo (banjo, guitar, and true hipness); Rob Adkins (bass, and serious joy). And — for the cinematically-minded — when I had first been at Radegast the room had been so atmospherically dark that I could just about discern the faces of the musicians. Better light this time, much appreciated! I have watched that clip a dozen times and it improves under scrutiny: the GSS rocks, and you might enjoy watching the body language of a group of very happy improvisers — they rock and grin, too! And the set ended with a little rough-and-ready jam session on the wonderful LOVE NEST (which will remind some of you of Burns and Allen, some of a 1944 Commodore record session that brought together Max Kaminsky, Rod Cless, and James P. Johnson). Here the Grand Street Stompers were joined by the very engaging Lucy Weinman (of the Big Tent Jazz Band) who knows what it is to swing out. Cool stockings and great ensemble lines, no? REMEMBER! ALL MONEY GOES TO THE MUSICIANS! SO PLEASE CLICK ON THE LINK BELOW AND BE GENEROUS!